When it comes to fabulous bathroom design, bathroom tiles certainly have a huge role to play. No longer seen as a necessity that serves a functional purpose, these days bathroom tiles additionally need to be gorgeous too. They are also able to make or break a space and they provide the perfect backdrop to our spa-like wet rooms, bathrooms and small but functional cloakrooms. With such a vast amount of choice on the market, however, you would be forgiven for being, well, a little overwhelmed. At Doug Cleghorn Bathrooms, we have almost ten years worth of experience specialising in luxury bathrooms and so we like to think we know a thing or two when it comes to beautiful bathroom tiles. From the revival of sumptuous marble to the sleek qualities of a matte finish, stay with us as we explore this year’s trending bathroom tiles. Inject a bit of life into your walls by combining stylish bathroom tiles that have subtle yet contrasting finishes. Surprisingly, matte and gloss tiles of the same colour go incredibly well together and will create a stunning effect in your new bathroom with light bouncing off only the gloss surfaces. This trend also suggests mixing materials such as concrete and wood together too and if you’re feeling really brave, how about experimenting with different types of shaped bathroom tiles? Our popular ‘Metro’ or brick shaped tile has been a favourite amongst our customers for a while now but trendsetters at the forefront of bathroom design have decided it’s time to mix things up a little. ‘Brickettes’ are a longer, more slender version of the brick tile and can be stacked vertically, horizontally or for a really stylish take on this trend, diagonally, to create a chevron-like herringbone effect. Softer lines bring a more calming feel to the bathroom and so for this there is always scallop and circular-shaped bathroom tiles. Bathroom tiles go very grown up now as the trend for marble returns in luxury interior design. Once a material reserved for only the finest hotels, marble effect tiles have made the look accessible to all and style-conscious homeowners cannot get enough. 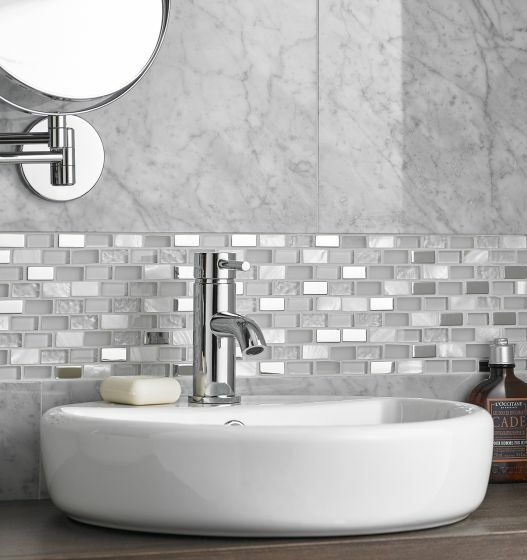 Why not add a touch of extravagance to your bathroom with a feature wall made up of marble mosaic tiles? I don’t think we’ll ever get bored of beige and if the trend forecast for bathroom tiles would have us believe correctly, neutral colours are still very much all the rage. Creating a spa-like, sanctuary of indulgence, Stipple beige bathroom tiles are a firm favourite amongst our customers and also look lovely when paired with a decorative mosaic feature wall. Our recent Wetherby project demonstrates this balanced look just perfectly. Packed with appeal, the rise of the heritage-style bathroom continues to boom throughout 2018 as more homeowners lean towards traditional character and charm. At Doug Cleghorn Bathrooms, we have undertaken many period-style projects and this standout Utopia flooring will ensure that the vintage vibes flow freely throughout your bathroom tiles. So, there you have it! We hope you have enjoyed learning about this year’s trending bathroom tiles and how they can be worked into the design of your Doug Cleghorn bathroom. Whatever stage you’re at, our knowledgeable team are on hand offering any guidance and support you may need with your project and more crucially, helping you to source the perfect bathroom tiles.